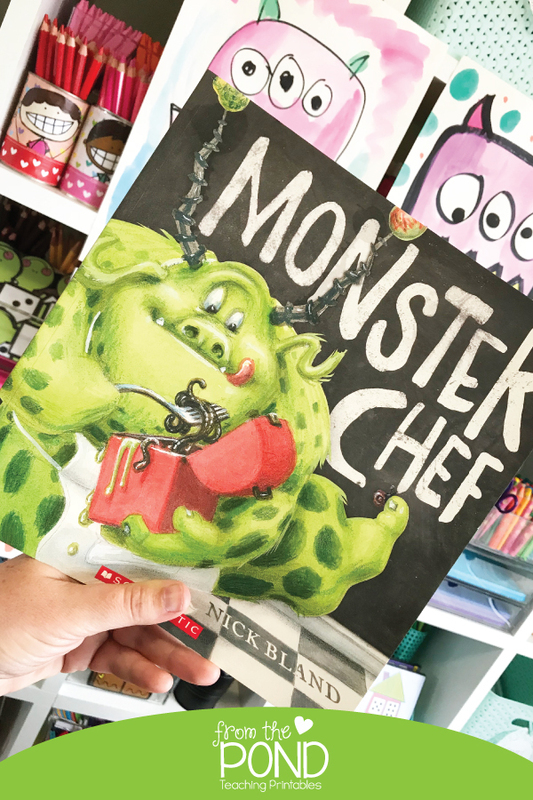 Monster Chef (Amazon affiliate link) is a fun children's book about Marcel, the monster who isn't scary. He has crotchety horns and googly eyes. He is lumpy and grumpy and suitably hairy! Sam and I read this together several times this week. The thing I noticed most, beyond the alluring illustrations (they seriously draw you inward towards the page).. was the author's word choice. The book provides a great opportunity to analyse how to write clear vivid descriptions while keeping a nice flow and pace through the text. interesting (but not too-tricky) words that encourage a deeper understanding of how the action progresses through the story - flicked, crossed, stirred, poured, plucked, sizzled, fried, boiled, crawling, hot, smelly, bite, lurk, climbed, rode, hopped, screamed, ran, fright, horrified, terrified, pride, delight, snarling, snorting..... Write these up on a chart. Identify verbs, adverbs, and adjectives. Also note with students - Marcel certainly has monster-like features, but we are told with text evidence, that he is not scary. How has the author created this scenario? Make a list with your students of how the author convinced us, in illustration and words, that he 'just wasn't scary'. What would it take to make him scary if this was a different version of the book? Ask the students to imagine how as an author they would do this. 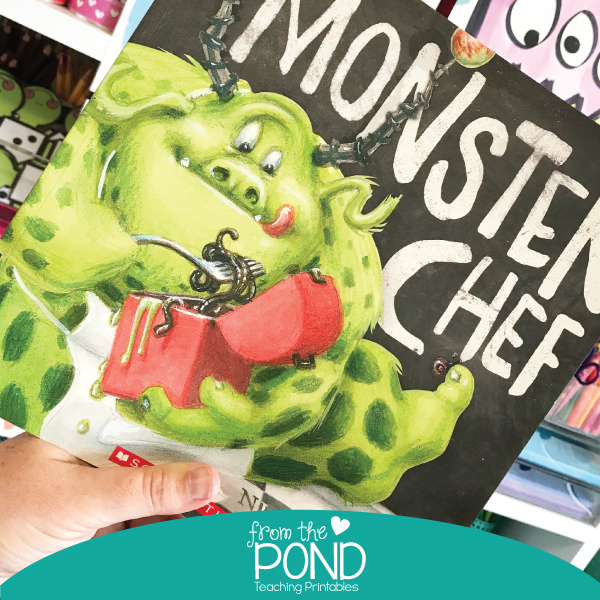 Monster Chef features stunning illustrations, serving up detailed interesting scenes on every page turn through the book. A simple but effective vocabulary activity to do with younger students would be a picture talk. Ask them to identify every single item they see on one of the pages. Ask contributors to point to something and name it. Build up with them, some noun groups - e.g. if a child identifies 'cockroaches' from the kitchen table illustration, encourage 'plate of cockroaches'. Write these noun groups down on a chart as you create them. Title the chart 'noun groups'. 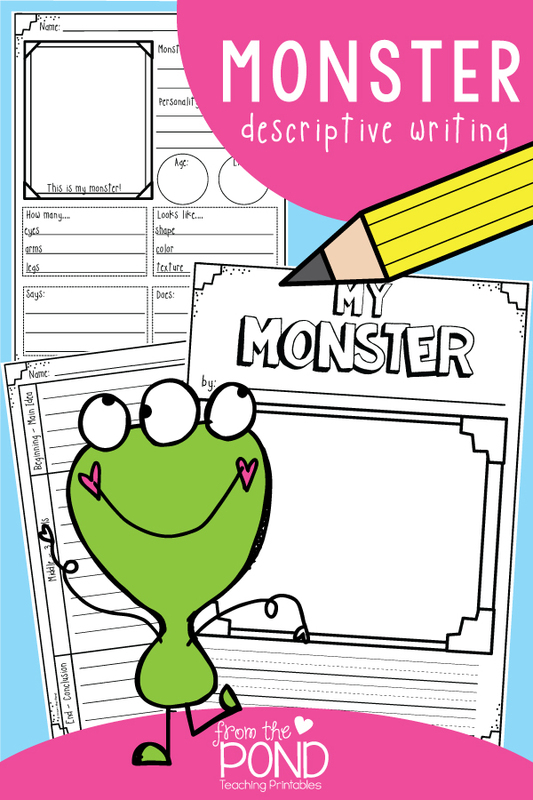 We have a printable 'My Monster' descriptive writing packet that will make prepping a quality week of writing for your students fast and effective. 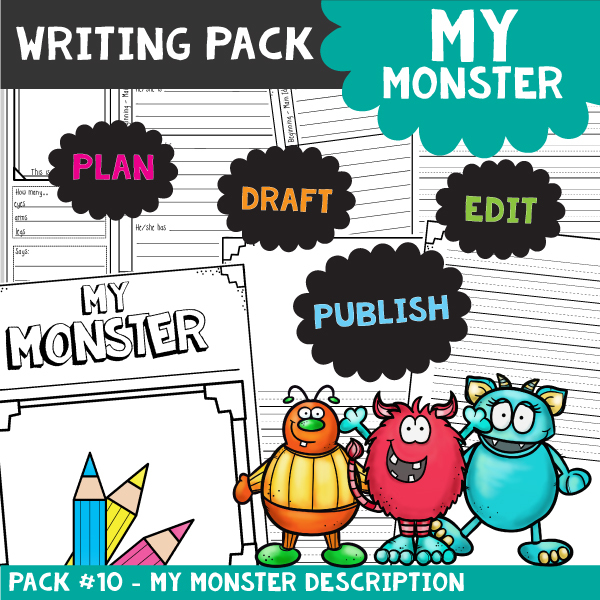 It includes everything you need for a week of writing! Print the prompts and papers to guide your students through the PLAN - DRAFT - EDIT - PUBLISH stages of writing. If you love keeping up to date with our new resources, hop over to the website to read more about our newsletter. We would simply love to have you!